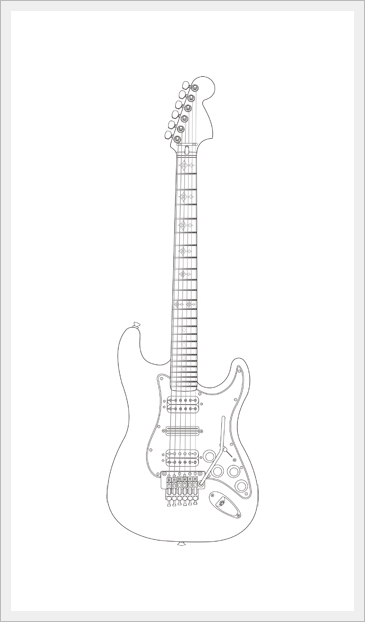 You always wanted to now and learn how to draw a guitar illustration? 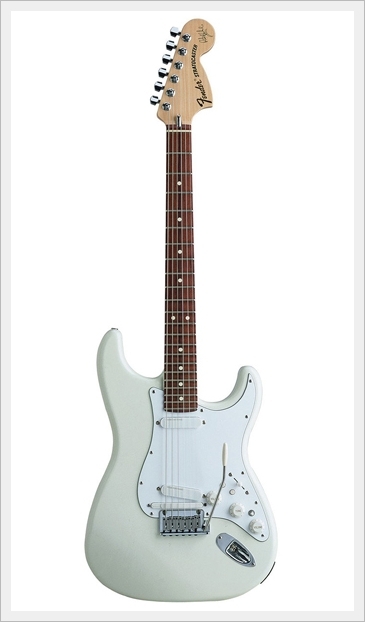 First that you will need is a very good photograph of guitar that you want to draw. It is good that you try to find a pictures of floyd rose or any other parts like guitars tuners where you need to see a lot of small details. People often send me their own picture of guitar they have at home, so I can tell them for which parts they need to take special care when taking pictures. 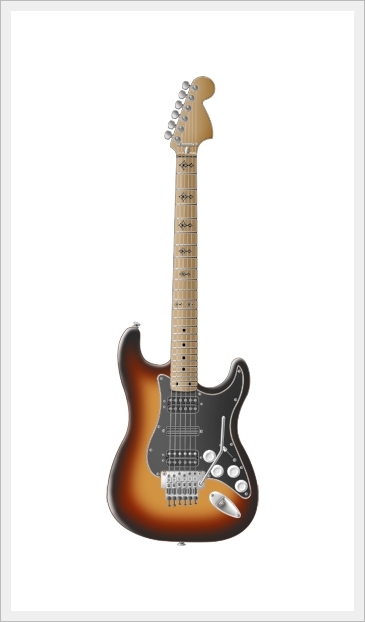 For this custom Fender Stratocaster guitar which I have choose to use for tutorial I used this picture below to get accurate body and headstock shape. 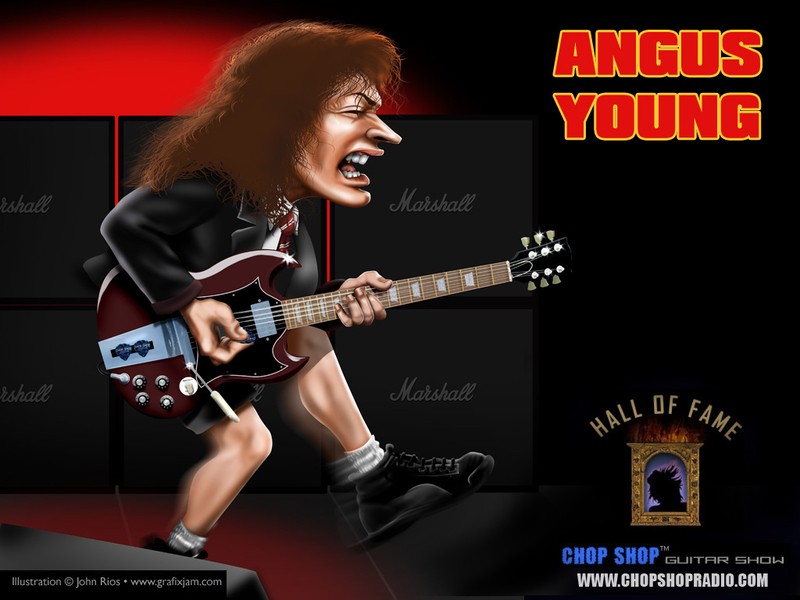 For floyd I have special picture, also for each pickup on guitar I have a separate high quality picture. 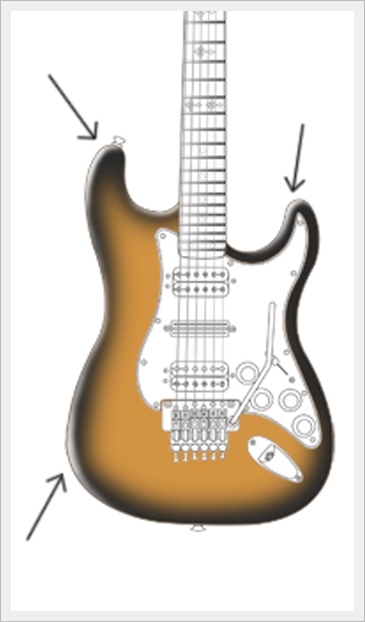 I am using Corel Draw X3 for drawing a guitar main lines like in picture below. Tools that I use in Corel are mainly Polyline Tool which I use to draw all main lines of a guitar. Shape Tool and Convert Line To Curve Tool I use for shaping the straight lines. Tickness of lines are 0.25mm for main guitar body lines and 0.18mm for all other guitar parts, like hardware, knobs, switches... This is something that satisfy me, you can try to use whatever line tickness you want. Just experiment with that. When your work is done and you get picture like this below, then it is time to export that image into JPEG format in maximum quality without any compression and in resolution of 300dpi. Next thing you need to do is open your Photoshop and open your exported JPEG image. I use Photoshop CS3 but you can also use older version like CS and CS2. Now double click on image to convert it to layer. Name that layer as „Main Layer“ or something like that. Most imporant thing is that you do not work or paint anything on that Main Layer except use it for selection of parts you want to colour. After you have selected area which you want to colour by using a Magic Wand Tool then you create new layer and name it for example „guitar body colour“. My illustrations just for example have 20-50 layers when they are completely finished. 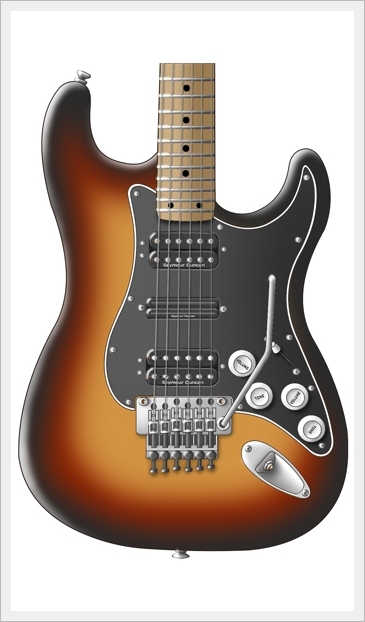 First thing I do is colouring a body of guitar like in picture below. This guitar will be in sunburst colour, so first thing I do is applying yellow colour using a Paint Bucket Tool. How to do that? 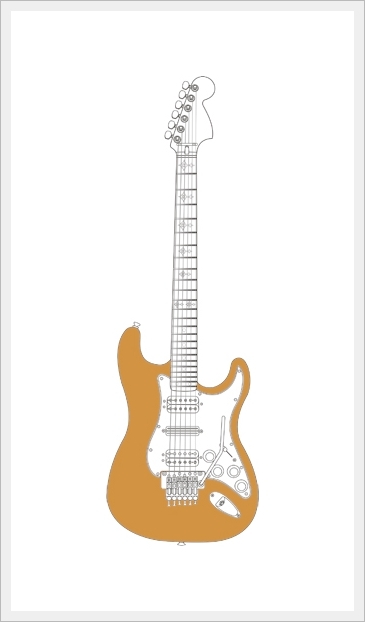 Choose Magic Wand Tool, click on Main Layer and select whole guitar body which need to be colored. Then create a new layer and name it whatever you want or for example „Guitar body color“ then use Paint Bucket Tool to apply yellow colour. Next step is applying some black colour around guitar body also in new layer. 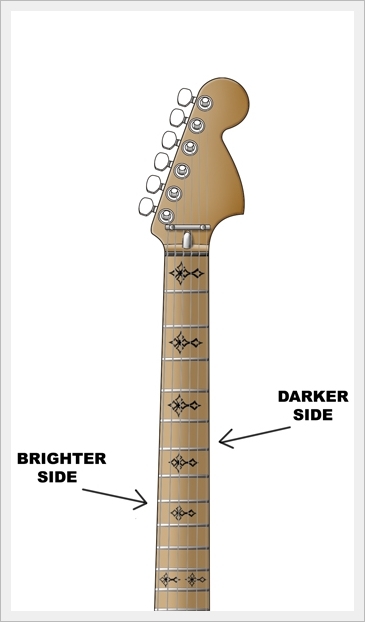 This layer must be above the „guitar body colour“ layer. For applying black colour I use Brush Tool with Opacity to 25% and full black colour. Choose the size of brush for yourself. You will need a several passes with brush tool to get desired effect. This is something you need to practice. After that I use Dodge Tool to highlight some dark parts for more realistic look (marked with arrows on picture). For that you need to decide from which side light is falling on you guitar. In my case that is from upper left side. Now you need to apply red colour in same way like black colour. Again, select guitar body using Main Layer, then create new layer and put it between black and yellow layer. Again use Brush Tool to apply red colour. You will also need several passes with brush until you get desired colour. Next thing is headstock, guitar neck and inlays. For headstock I use Paintbucket Tool and Dodge/Burn Tools to highlight some parts of headstock and make it more realistic. For applying colour to neck you will need Gradient Tool because I don't colour neck in one colour like in my begining with guitar illustrations. Now I like one side of neck to be brighter and other little darker because you now that guitar neck is not completely flat. For inlays like in this case (crosses) you will need Paint Bucket Tool and Brush Tool for some small correctings and glitches. Otherwise you just use Paint Bucket Tool. Now I am applying colour to pickups using Paint Bucket Tool and Dodge/Burn Tool to create brighter and darker sides to get more realistic looking pickup. This depends where is your source of light position so that you know which side must be bright and which dark. In this way your 2D pickups will became more 3D and more realistic. This is technique which you need to practice. Next things are guitar hardware, floyd rose, input jack, strap locks, machine heads, tuners, pickguard. I don't want to explain all these things separetly because technique is same as before. Most important thing to remember is to create a new layer for each one of these things and paint it separately. When all is over then I add some shadow to guitar strings using Brush Tool with opacity 25% and full black colour. Pickups and floyd rose also need some shadow job with a little larger brush settings. You can add shadow for almost all parts on guitar. There is no rule, you can choose for your self on which parts you will add shadow or not. I personaly pay attention to a little details which cannot be seen but still when you have a lot of small details like that your illustration overall appereance is much better in the end. Important thing is that you create a new layer for shadowing and put it to the top of all layers. 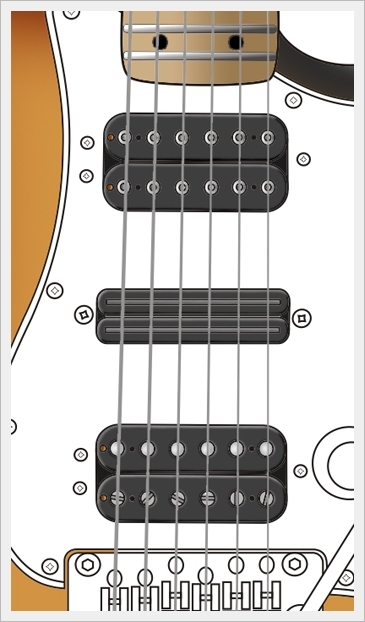 At the end you need to add text to guitar, like on pickups (Seymour Duncan in this case), volume and tone knobs, Fender logo on guitar headstock. For all that you need to use Horizontal Type Tool. Just choose font style and size and that is it. I hope that this tutorial will help you to understand how I draw my illustrations, and even encourage you to try to make your first guitar illustration in your unique way. You can write me on my mail or even guestbook and tell me is this tutorial was helpfull to you. I apologize if there is some grammatical errors in my writing but english is not my primary language so I hope that you will understand.